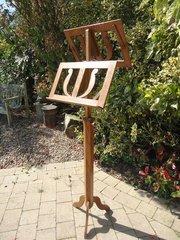 Delightful Arts & Crafts oak duet music stand. Offered in good condition having been stripped and refinished. Minor chip to edge of one corner. It stands firm and both sides are fully adjustable held in place by an oak screw. Height not extended 114cms. Height extended 162cms. Sheet sectionsize 51cms x 30cms. 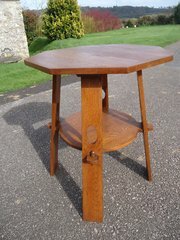 Arts & crafts oak lamp table with an octagonal top on a tripod base with pretty piercings to legs. Offered in excellent condition having been stripped and refinished. It stands 71cms high and the top measures 45cms x 49cms. Very unusual Arts & Crafts oak corner chair as retailed by Liberty. 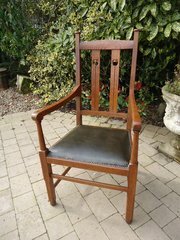 This has a newly upholstered studded green leather seat and the chair has been cleaned and polished. Nice dowelled detail and a lovely design most probably by Leonard Wyburd. Offered in very good condition. Height 74cms. Width 64cms. Depth from corner to front 42cms. Seat height 44cms. 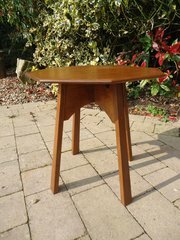 Sweet little oak side table with an octagonal top and four out swept legs. This has been stripped and refinished to a lovely honey colour and is offered in excellent condition. Height 46cms. The top measures 45cms x 49cms. 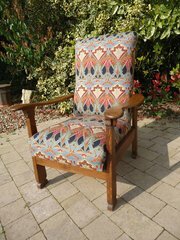 Arts & Crafts oak reclining chair with Liberty Birmingham ivorine label to back. Offered in good condition having been stripped and re finished and professionally re upholstered in Liberty Ianthe s fabric. Shown in upright and reclined position however there are nor fixings to hold either position in place. Weight of occupant controls position. Very comfortable. Width 78cms. Depth 82cms. Height 97cms. Seat height 45cms. 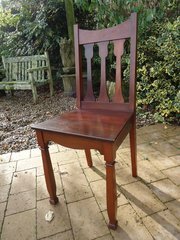 Arts & Crafts Glasgow school oak arm dining chair by Wylie & Lochhead with stylised tulips to back and round capped columns. 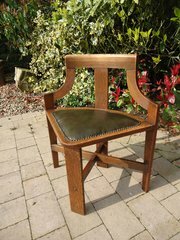 Offered in good condition having been stripped and re-finished and upholstered in green leather with a studded border. Height 116cms. Seat height 46cms. Arm height 75cms. Total depth 60cms. Width at front of arms 60cms. Matches set of four I have listed on this site. 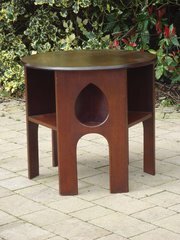 Arts & Crafts book table in oak with teardrop cut outs to three sides and shelves to alternate three. Height 56cms, Diameter of top 61cms. Height of shelves 24cms. Offered in good original condition and has not been stripped = just the top refinished. 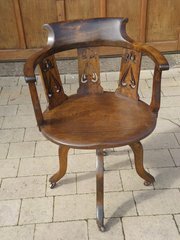 Arts & Crafts Hall chair in walnut attributed to Shapland and Petter by design thought carries no markings. Offered in good original condition but with some marks to seat, Height 93cms. Seat height 46cms. Width at front of seat 42cms, Depth 40cms. 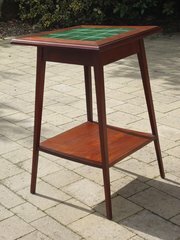 Arts & Crafts tiled top table in walnut with green tiles to top. Offered in good condition having been stripped and refinised. Height 70cms. The top measures 46cms square. Pretty Arts & Crafts swivel desk chair with piercings to back. It has a comfortable seat and revolves well. Made mostly of oak with the top in beech. Offered in good condition having been stripped and re polished. New screws to metal base. Height 60cms. Width 58cms. Depth 46cms. Seat height 45cms. An unusual large Arts & Crafts oak two tiered pegged table with an octagonal top. Almost large enough for a dining table for two measuring 76cms high and the top measuring 46cms x 49cms. 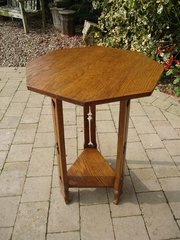 offered in good condition having been stripped and refinished showing its lovely grain. 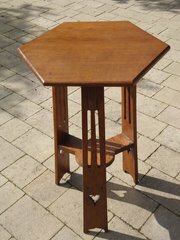 Pretty Arts & Crafts oak lamp table on a tripod base with legs pierced with hearts. Offered in good condition having been stripped and refinished. Probably retailed by Liberty. Height 70cms. The hexagonal top measures 40cms x 46cms.